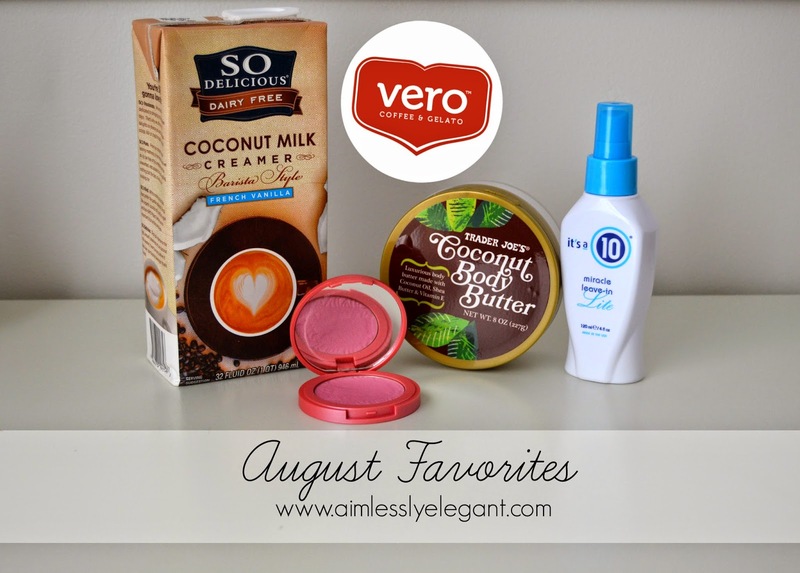 Today I wanted to share with you a few of my favorite products for the month of August. I know September rolled around last week and I'm a little late to the show, but that has just been my theme lately so you're going to have to roll with it! A bit ago I wrote about my quest to cut out coffee. That lasted all of 2 weeks, seriously. There is just something about that morning cup. It has nothing to do with the caffeine, in fact that morning cup is the only caffeine I consume all day. It's the warmth, and just I don't even know what it is, it's just my morning goodness. The one thing I really didn't like about it was that I had used Coffeemate creamer in my coffee forever, and the list of ingredients that it was made out of (if you've never looked at it, which I hadn't until not too long ago, you need to) is a mile long, and I don't really know what half of them are. Not only that, sugar. I have been trying to cut back on my use of added sugar and I felt like this was one sure place to do so. My coworker turned me onto this Coconut Creamer and I love it. She always talked about it, but I was just convinced that my grocery store didn't carry it, and I'd have to make a trip to Whole Foods to pick it up. Turns out I was just looking in the wrong place! It's not refrigerated, but instead on the same shelf as the other boxed nondairy milks, and to top it off it's about the same price as the Coffeemate creamer I was previously using, but now I recognize all of the ingredients! At the grocery store that we shop at, Mariano's, they have a coffee & gelato bar called Vero. We have shopped here for a few years, but I had never stopped at Vero until recently. A few weeks ago we were getting dinner before doing some grocery shopping at Mariano's. We were sitting in their eating area, and it was absolutely freezing so I decided I needed a warm drink. We had just come from acupuncture where I was told no dairy, very limited caffeine, and watch your added sugars. I was able to satisfy all of that, AND it tasted amazing. Vero had a chai latte (one of my favorites) that said it was naturally sweetened, and they had almond milk at no additional charge. I have to actually say it was better then my Starbucks Chai Latte and at $3 instead of $5 I can't complain. I think part of what made it so good was the almond milk, thinking about it is making me want another! I jumped on the Tarte Amazonian Blush band wagon a few months ago, and I'm still going. Up until this point I have always primarily had one blush I use at a time. It was never something I thought about switching up, I always bought one that I thought just enhanced my natural color and left it at that. Lately I was really wanting to try a blush that was distinctly more on the pinky side and Dollface definitely fits the bill. It was hard for me to decide which one to go with because Tarte makes so many pretty colors, but if you literally think of a dollface and their rosy cheeks, it only seemed fitting for what I was looking for. It offers a nice subtle pink to the cheeks. My only complaint is that I just don't think this color sticks around quite as long as my other Tarte blush in Glisten, but it does still last for a good amount of time. I am quite particular with what I put on my body lately. In fact, usually I stick to my homemade lotion bars, but on one of my recent trips to Trader Joe's I through their Coconut Body Butter in my cart. Really you can't go wrong with anything coconut scented, at least in my opinion. The thing about my lotion bars on hot humid summer days is that sometimes it stays a little greasy for a little too long, taking awhile to soak in. Not only does this Coconut Body Butter smell amazing (I had multiple people comment on it/ask what I was wearing) it also soaks in great leaving no greasy film on the skin in hot humid summer weather, plus it's super thick and moisturizing. More than worth it's $4.99 price tag, that is if your lucky enough to live close to a Trader Joe's. Everywhere I found it online was more expensive, so stock up if you're near one! I had first tried It's A 10 Miracle Leave in this spring when I got the version with keratin as a freebie during one of my Ulta trips. I absolutely loved how soft it made my hair. I always wait till I get a 20% off entire purchase coupon to stock up on all of the odds and ends that I need. Well once I had one I went back for more It's A 10 Miracle Leave In, only thing was it wasn't that simple. When I went back I noticed they had many different versions of their leave in, of course. They had the regular leave in, the plus keratin, a lite version, a silky version. Based on reading the back I went with the lite version because it specifically said it was good for fine hair, and with that I agree. Spraying a little on once out of the shower made a world of difference to come through my curly, wet, tangley, mess. And it also helped to combat the usual summer frizz. Ah! Thank you for sharing about the creamer! I need to cut out my morning cup of coffee but have made peace with the fact that I just can't. But I spend the entire morning feeling like crap afterwards. A lot of people have told me to try a non-dairy creamer (I use the coffeemate vanilla like you did). I wonder if that'll make a difference! When I make tea, I use almond milk for creamer and have ZERO problems with my stomach so I bet it would make all the difference! I'll have to pick this up next time! I don't drink coffee but even to me that creamer sounds amazing! I bought a bottle of It's a 10 because I heard so many amazing things about it, and it made my hair feel so crunchy and dry! I thought maybe it didn't work for my hair texture (curly and fine) but since you say you have the same hair type, maybe I should bust it out and try it again. You definitely should give this a try! I've tried soy creamer, and some other non-dairy creamers and they all tasted like nothing to me, especially after using the Cofeemate which is pretty sweet. This definitely isn't as sweet, but it's been the best alternative I've found thus far! What a bummer that it made your hair crunchy and dry! Maybe it was a combination of products? Who knows? I'm thinking in the winter when it's even more dry out I'll go back to using the heavier version with the keratin in it. Give it another try, I hope it works for you! Ummm I need to try that creamer - it looks and sounds amazing!! Yay for Tarte blushes! I have Dollface, too, and I find it isn't as pigmented as the others, but it still gets the job done. That It's a 10 leave in stuff sounds great - I'll check it out next time I'm at Ulta. Well I'm glad to know it isn't just me who thinks that with Dollface. Check out the It's a 10, the only challenging part is picking out which leave in to choose, just like everything else there is a million different choices! I want to try out the lite it's a 10 spray! I used to be obsessed with the regular version, then I tried the keratin one and didn't like it at all and just kind of stopped using it all together! I am definitely going to look for that creamer- it sounds delicious! I've never tried the regular version, but I seemed to have pretty good luck with the keratin one. Maybe I should try that one next. Go for the creamer, it's pretty good! Thanks for stopping by!